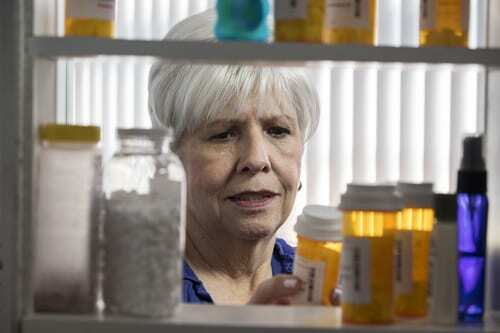 Pain is real and often a common element in the daily life of the elderly. That’s why understanding and managing pain in the elderly is important. Pain plays a significant role in in mood, motivation and general quality of life. Yet understanding how pain is affecting someone, other than yourself, is elusive. You might as well try and taste it. So how do you know the pain another person is experiencing or how much it is affecting their ability to enjoy life? The first step in understanding and managing pain in the elderly to recognize it has nothing to do with you. No matter what kind of pain you may have experienced in the past, you still have no idea what the other person is experiencing. Each of us deal with pain uniquely. What you felt when you broke your arm, gave birth to a child, or underwent surgery has no relation to what someone else felt when those same things happened to them. Pain and the experience of pain is unique to each of us. The third step in understanding and managing pain in the elderly is to provide them a method to describe what it feels like to them. The best way to accomplish this is by using a pain scale. There are a variety of pain scales to choose from. Finding the one that is best for you is a personalized choice. This is a great article to review 15 different type of pain scales and how they are used. Out of those choices we thought this one was perfect. 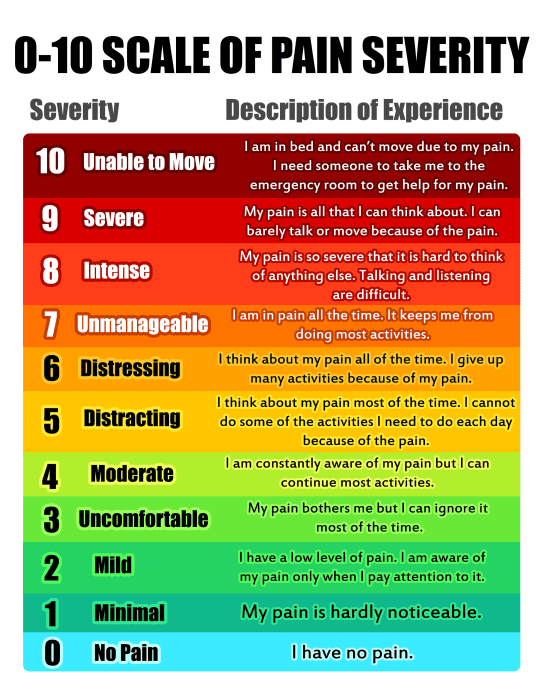 This pain scale provids a descriptor and color codes to help zero in on exactly what level of pain is being experienced. A pain scale is a great tool for bridging the gap between the pain a person is experiencing and your interpretation of what they are feeling. It is also a good tool for tracking someone’s level of pain throughout the day or on a daily basis. Understanding and managing pain in the elderly lets you explore methods to eliminate or reduce the level of pain. Most of the time this discussion should occur with the assistance of a medical professional. Succession of activities which alleviate pain or taking medication may not be the best choices to eliminate pain. A medical professional should be consulted for all forms of acute or chronic pain to ensure the best practice is being employed to treat pain symptoms. If you have already received medical advice it is important to track the effectiveness of the treatment. Your medical professional may choose to begin with one form and switch to another form of treatment depending on how well you respond. That is because there are many forms of treatment for pain, such as medication, massage, physical therapy, meditation, rest, acupuncture, weight loss, and surgery. And this is not a comprehensive list of possible pain treatments. Which method works best for you may not work at all for someone else. The fifth step to understanding and managing pain in the elderly is attitude. Yours and the attitude of the person experiencing pain. Remember the closest you can come to understanding their pain is by using a pain scale. 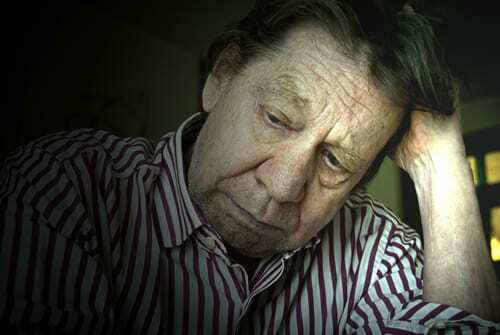 However, that understanding can help you foster the right environment to help your loved one effectively navigate pain. For example, you can reschedule activities. Perhaps you can hire the kid down the street to rake the leaves. Maybe bring in someone to cook meals and take care of some of the daily housework, like dishes and laundry. If you were planning on going shopping, perhaps that can be scheduled for a “better” pain day. Maybe today you can watch a movie together. By managing expectations and activities you may be able to lessen the emotion of pain and maintain a positive attitude. Getting depressed and being overwhelmed by pain can be just a debilitating as the pain itself. Keeping those emotions in check with the right attitude helps manage pain. “Depression and anxiety can intensify feelings, including pain, hopelessness and sadness. Mentally, emotionally and physically, everything sensory, including pain, ratchets up.” —Dr. Buxton, clinical assistant professor of medicine at Virginia Commonwealth University and director of the private Center for Palliative Psychiatry, Richmond, VA. The Emotion–Pain Connection. 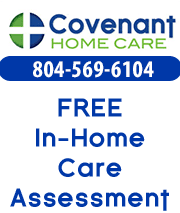 Understanding and managing pain in the elderly is a process of using tools to help them adequately describe it with a pain scale. Ensure they are discussing pain levels with their doctor and reporting to their doctor the results of prescribed treatments. 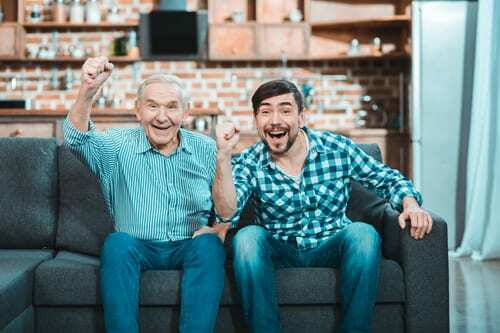 Provide them with assistance and support that fosters a positive attitude about life to ward off feelings of depression, sadness and hopelessness. This may not eliminate pain from their life, but it will help manage and reduce the amount of pain that is experienced.